Bremshey BE7 Exercise Bike is a residential upright exercise bike. It has some good features such as easy-to-operate, contains 4 user programs, total of 22 programmes, backlit LCD screen, servo operated magnetic break and 3 different heart rate control programs. Motion-Dynamic-generating-system (MDGS) Workout and be eco friendly at the same time with the unique MDGS. Functional design with a focus on energetic users. A battery in the console enables you to set, without pedalling, the program of your choice! Many motivating training options. A total of 22 programmes, so a programme of choice for every user. There are 3 different heart rate control programs that can be set at 55%,75%,90% of your maximum heart rate allowing you to work in either fat burn, cardio or anaerobic zones. Easy to operate and use. The monitor is equipped with a backlit colour LCD screen. *Note: Most of the sites, stores or shopping portals listed above sell Bremshey BE7 Exercise Bike with discounts and other exciting offers. There is a possibility that the some of above websites are not selling Bremshey BE7 Exercise Bike now. Toughtrain.com is not liable for such cases or instances. 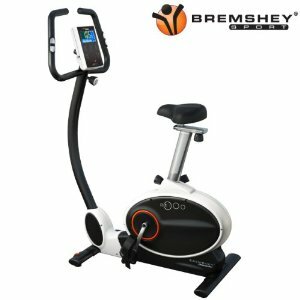 Also we do not recommend any seller for Bremshey BE7 Exercise Bike and a buyer should buy from where he/she gets best deal with quality of products, service and on time delivery (shipment).